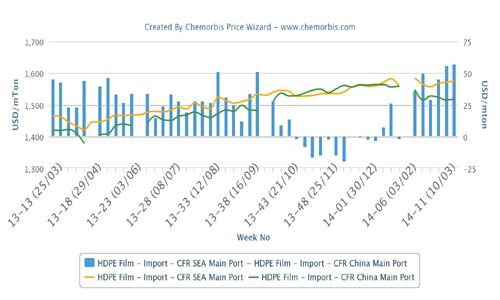 In Asia, Southeast Asian and Middle Eastern producers started to issue their February PP and PE prices this past week as per ChemOrbis pricing service. At the beginning of last week, an agent of a Southeast Asian producer reported that their supplier announced February import PP and PE prices to Vietnam and Malaysia. 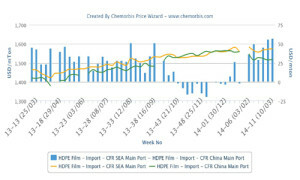 The new prices indicate identical decreases in both countries at $80/ton for LDPE and $100/ton for homo-PP. Meanwhile, the producer’s PP random copolymer injection and PP block copolymer injection offers are down by $110/ton and $160/ton, respectively. A source from the company pointed to their pessimistic outlook for next month for their decreases. A different Southeast Asian producer issued their new February prices both to China and to Southeast Asia. The producer’s new prices indicate decreases of $100/ton for LDPE film, $140/ton for HDPE, $130/ton for homo-PP and $200/ton for PP block copolymer. A source from the company reported that they were able to conclude deals in China at their initial levels. February is a short month in terms of working days. Most players are expected to have prolonged Chinese New Year holidays and therefore, they prefer to stock up before they leave their desks before the holiday. “Overall demand performs better in China when compared to Southeast Asia, where further decrease expectations prevail and hinder sales. However, we are optimistic that Southeast Asian buyers will return to the market over the near term to make fresh purchases,” added the source. When the week was closing, a Middle Eastern producer also issued their new February PP and PE prices to Southeast Asia. The producer’s new prices indicate sizeable decreases of $100/ton for homo-PP, $120/ton for BOPP, $50/ton for PP block copolymer, $40-60/ton for LLDPE film and $60-70/ton for HDPE film. According to ChemOrbis, a Southeast Asian trader commented that they do not think that the producer’s prices will prove workable in the regional markets, where most buyers are looking for levels below the $1100/ton threshold on CIF, cash basis.